In a regular bowl, combine all the dipping sauce ingredients. Mix it well and set aside. Using a mortar and pestle (dikdikan), pound the small shrimps until it becomes mashed up. In a bowl, combine flour, mashed up shrimps, chives, red chilis, salt and pepper. Stir it well to combine. Gradually, add hot water into the bowl (1 batch at a time) and continue mixing it well every time you add a batch of water. Mix it well until it becomes a paste. Let it cool and set aside for some minutes. To mold it, prepare a small bowl of water and wet your hands everytime you scoop a mixture. Scoop it with your wet hands and mold it on your 2 wet palms (it wont stick on your palm if your hand is wet). Roll it into your palm to form a ball. Do the same procedure until all mixture are formed into okoy balls. Heat enough oil for deep frying in a shallow pot. When the oil is hot, drop each ball into the hot oil. Do it in batches and avoid overcrowding the pot. Let it fry over medium heat until golden brown and crispy. Using a large slotted spoon scoop out each balls to drain from oil. Transfer into a paper lined bowl. 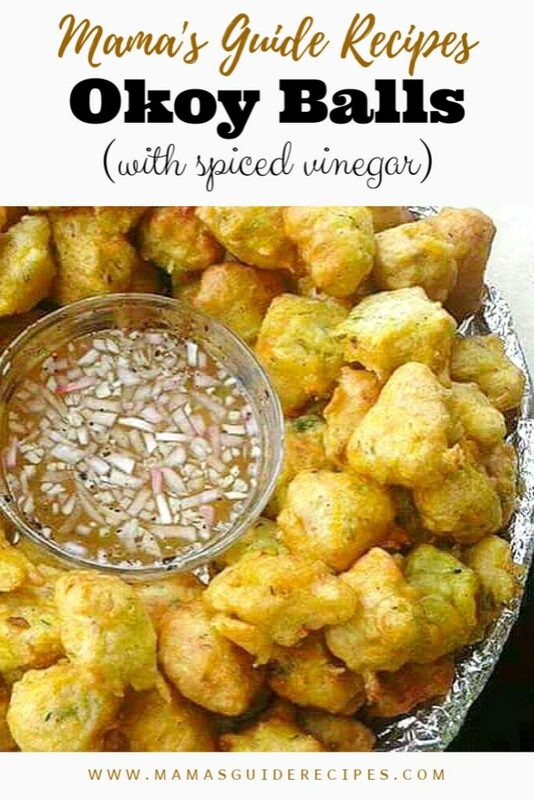 Serve it on a plate hot and crispy with your spiced vinegar sauce bowl in the center.